“Ukraine has always supported the aspirations of the Palestinians to create their own state,” Foreign Minister Anatoly Zlenko declared on October 15 during a joint press conference with the Minister of Planning and International Cooperation of the Palestinian National Authority, Nabil Sha’at. 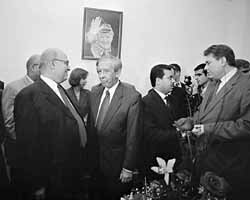 That same day, an official ceremony inaugurating the Palestinian Embassy was held in Kyiv. The opening of the embassy, at first sight a quite ordinary event, took place against an intriguing background. First, the Palestinians are opening an embassy, not a mission or a diplomatic office, evidence of de facto recognition of Palestinian statehood by Ukraine. Second, the embassy will represent Palestine itself, not the National Authority of Palestine, which is further evidence of recognition. Third, the opening of the embassy and rather stentorian statements of the Ukrainian Foreign Ministry head occurred against the backdrop of the anti-terrorist campaign and the playing of the Palestinian card by Terrorist No. 1 Usama bin Laden. As noted by some journalists, there is another unhappy coincidence, the downing of the Tu- 154 plane whose passengers were predominantly Jews against the background of Kyiv’s strengthening relationship with Palestine. Foreign Minister Zlenko spared no effort to dispel any possible undertones related to the embassy’s opening, stressing that Ukraine’s attitude toward Palestine was not born overnight. Incidentally, he noted, there are nearly eighty diplomatic offices of Palestine in various countries, fifty of them embassies. Thus, Ukraine is not an exception but the rule. And there is no link whatever between the Ukrainian-Palestinian relationship and the tragedy involving the ill-fated Tu- 154, he believes. Meanwhile, Palestinian Minister Sha’at pointed out that Ukraine can join the club of nations bent on solving the conflict in the Middle East, notably, France, Germany, Norway, the United States, Russia, Egypt, Jordan, Saudi Arabia, and Turkey. “I would only be happy if Ukraine joins these countries,” Mr. Sha’at emphasized. Ukraine, it seems, is not against demonstrating its peacekeeping skills in the Middle East yet again, with the Ukrainian engineers battalion having been stationed in Libya for quite some time now. Last month, President Kuchma appointed his representative at the talks on the Middle East peace settlement. Moreover, on October 15 Kyiv proposed that Palestine hold negotiations with Israel in Ukraine. The Palestinian minister liked the idea and now the Israelis are to confirm their approval. Just like the EU and Turkey, Mr. Sha’at also proposed sending observers to Palestine. Meanwhile, Kyiv’s declaration of support for Palestinian statehood is only logical. In fact, the idea to open the embassy in Ukraine has been gestating for almost four years. It looks likely, that Ukraine, not Palestine, was dragging its feet on opening the embassy, fearing a negative response from Israel and the United States. These fears dissipated when President Bush recently opted for Palestinian statehood. Palestine will be represented in Ukraine by its interim charge d’affaires Valid Zakut. The Day’s sources say that the Palestinians wanted ambassadorial status for Mr. Zakut, but Ukraine preferred to show caution. There are many doubts, however, that Ukraine’s peace initiatives for the Middle East will have a happy ending. Kyiv’s attempts to mediate in the conflicts in Transnistria and Abkhazia have not produced any tangible results. Will the Middle East be next in line?